Beijing’s close ties with Islamabad don’t have to be a source for concern. It’s in China’s interests to press for reforms to stabilize Pakistan. Pakistani Prime Minister Syed Yousaf Raza Gilani starts an official four-day visit to China today. But while the formal reason is to celebrate the 60th anniversary of diplomatic relations between the two countries, the real focus is bound to be on how Pakistan can shore up ties with its most reliable ally after Osama bin Laden was found on Islamabad’s doorstep. Contrary to what some might think, such meetings could be a good thing, because the United States will need China’s help to stabilize its troubled partner. Since September 11, US officials have tried to constrain Pakistani support for the Taliban and other terrorist groups, while relying heavily on its backing for the military campaign against al-Qaeda. But bilateral ties have remained tense, because of both Pakistan’s assistance to Islamist extremists and popular Pakistani anger over US drone attacks along the Afghan-Pakistani border, which many Pakistanis believe stoke the terrorist danger in their country. No amount of economic aid by the Obama administration has been able to ease Pakistani concerns over US counterterrorist policies and Washington’s ties with India, with opinion polls showing that Pakistanis now overwhelmingly view China more favorably than the United States. Indeed, Americans are only shielded from the harsh reality of Pakistan’s views by distance and by the fact that its ruling coalition is led by the Western-oriented Pakistan People’s Party, which has traditionally enjoyed good ties with the United States. The opposition parties are generally, let’s say, less well-disposed toward Washington. Enter China, whose officials are quick to defend Pakistani policies, including its commitment to counterterrorism efforts—even after the bin Laden affair. While US officials have indicated that they couldn’t trust their Pakistani counterparts with advance news of the raid, the Chinese government has called for even greater support for Pakistan’s counterterrorism efforts as well as respect for its sovereignty. Such views are based on a history of security cooperation. 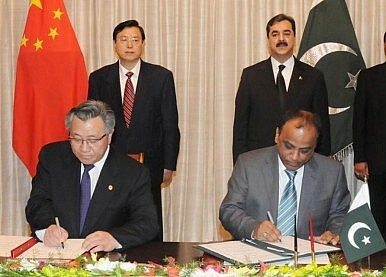 China has become one of Pakistan’s leading suppliers of conventional arms, and as well as selling weapons systems such as the Chengdu J-10 fighter planes and Zulfiquar class F-22P frigates, Chinese and Pakistani firms now engage in the joint production of important military hardware, such as the JF17 Thunder (FC-1 Fierce Dragon) fighter. Bilateral security cooperation has also extended to include the training of Pakistani defense personnel, the sharing of military intelligence, and the holding of joint military and counterterrorist exercises. But perhaps most importantly in Pakistani eyes, the Chinese have, unlike the Americans, provided Pakistan with weapons that Islamabad can use against India. Chinese strategists, for their part, are happy to indulge Pakistan’s concerns over New Delhi as a way to keep a rising India distracted.